Success shouldn’t be viewed as just an endgame; it’s about how you think, how you plan, and how you respond to challenges. You must be proactive in your thinking and planning. This will greatly increase your chances of success. You need to have a plan. If you don’t have a plan, then you plan to fail. Several years ago, when considering military retirement, I had to consider my own success and endgame. I had served in the military my entire adult life, and was currently serving as the Combined Arms Center, Senior Enlisted Advisor to a General Officer. During an appointment with my doctor, he asked me a question that made me think long and hard – and it’s one that sticks with me to this day. As a military leader I was trained to have answers in even the most difficult situations, but in this situation, I was left speechless. My doctor advised me to critically think about this question. If I could only identify myself as a solider, then I had some soul-searching to do. I failed to plan for life after the military because I could not imagine myself as anything but a soldier. Planning for a transition from military to civilian life after a 30-year career is not an easy task. Many decorated men and women before and after me have faced numerous difficulties when separating from the military. Those of you reading this blog may be facing similar challenges of your own, despite a successful career in uniform. Defining who you are is central to cracking the code of your military transition. Without this understanding, you run the risk of being lost at sea in a ship without sails. For the sake of the sacrifices you’ve made for your country and your loved ones, find yourself before you hang up your uniform. Finding yourself is a practical exercise. No matter who you are, you’ve changed over the years. Are you the same person at 40 as you were at 20? More than likely not – you’ve experienced adult life, likely learned some hard lessons, and have gained some wisdom. Use those experiences to define what success will mean to you after you retire. There is no road map for this process as it is a personal experience. As a leader, we can become so focused on the formation that we feel if we take time for ourselves then we are being selfish. Instead, we need to think about the impact we make on the men and women who look to us for guidance. How can we best set the example for them? By taking care of ourselves and planning for the future years before we ever consider retirement, we can show our units the power of planning and proactive thinking. Not only is this beneficial for our own success, but it’s also beneficial to the success of the mission of the U.S. Armed Forces. For me, and most of us, education is part and parcel of this success. Not only does finishing a degree give you a competitive advantage in the corporate world, it makes you more valuable in uniform. Having a bachelors degree made me a better leader, and the masters degree I was finishing as I was transitioning gave me an extra edge in the civilian workforce. On day one of your life in the military, have checkpoints in your career. Think about your progress in the military and how it best fulfills what you define as success. As you work your way through the ranks, consider your successes and failures and share these lessons with those around you. If you reach a point in your career where you’re not selected for an assignment or promotion, then you can look back on these checkpoints as a way to consider your next step. This blueprint for success will make it much easier for you to define who you are – and how you’re going to make your mark on the civilian world. So, if I’m not a soldier, then who am I? I am a soldier for life, and that will always be a part of who I am. But I am also a corporate leader, a mentor and an educator. Education and work experience have shown me new ways to define myself and my success in all that I do. Although the military has been a large chapter in my life, it is not the entire book. 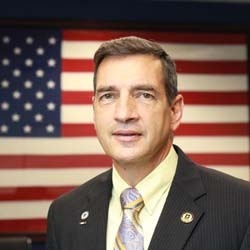 Philip F. Johndrow is a 33-year military veteran and a graduate of Trident’s Bachelor of Science in Business Administration and Master of Business Administration programs. He currently serves as Trident’s National Director of Military & Veteran Alliances.